It’s almost that time of year again. 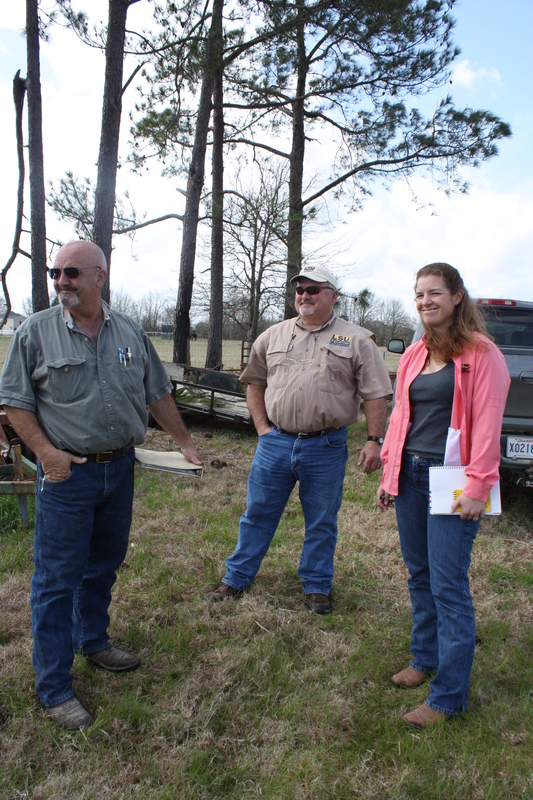 Today Anna and I met with County Agent Keith Fontenot and Evangeline Parish farmer Kenneth LaHaye to discuss plans for the 2011 rice water weevil demonstration test. Kent Guillory is the consultant who will assist with monitoring this test location. 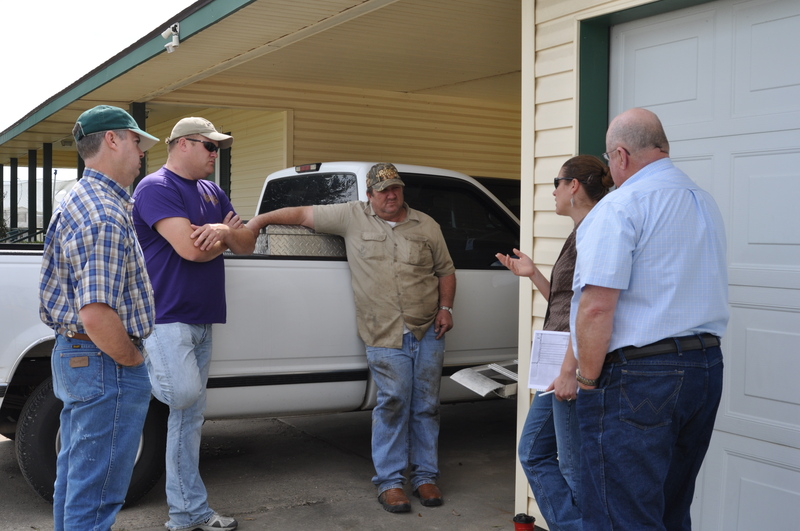 Mr. Kenneth LaHaye, County Agent Keith Fontenot, and me discussing plans for the demo test in Evangeline Parish. This will be the third year that we have worked with Kenneth (and his dog Harley) on a demo test site. We appreciate his continuing support of our on-farm demonstration program. The last two years we worked with Kenneth near Chicot Lake. This year, our test site is located near Vidrine on La-10. We will provide directions to the field after planting. Kenneth's dog Harley - she makes for great company in farm work. Kenneth will be planting RiceTec variety XL745 at a 25 pound per acre seeding rate. The seed treatments will be arranged in two blocks, with one rep in each block. Each rep will include two 20 ft drill passes. We intend to plant sometime between March 12 and 15, if the weather cooperates. Kenneth has already prepared the land for planting. A herbicide burndown of 32 oz/acre generic roundup and 2 oz/acre Valor was applied in November, 2010. When looking at the field we noticed some areas where his burndown did not provide control. 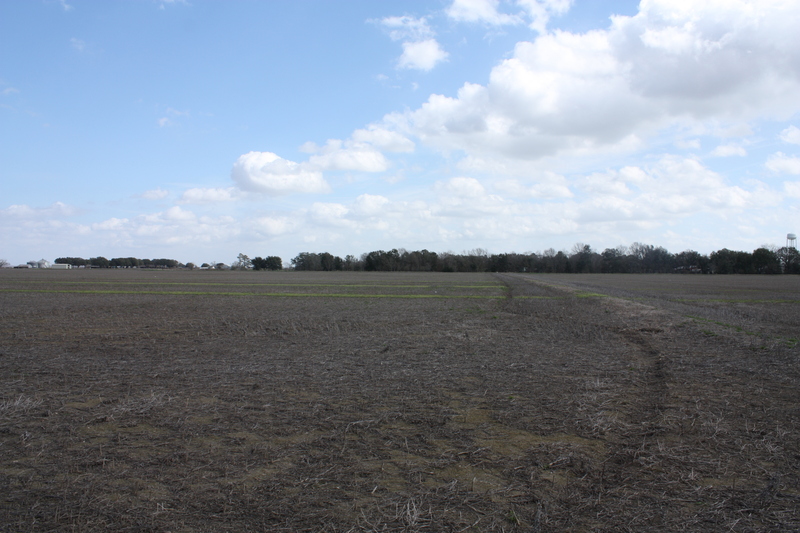 The weedy strips in the field are the result of tapping the boom and turning off an outside nozzle. Kenneth asked us to post this picture to illustrate how effective a burndown put out in November can be. The missed passes in the field are the perfect example of what he could have been fighting as he prepared to plant, had he decided to wait until spring to apply his burndown. Last season Kenneth grew soybeans in this field. 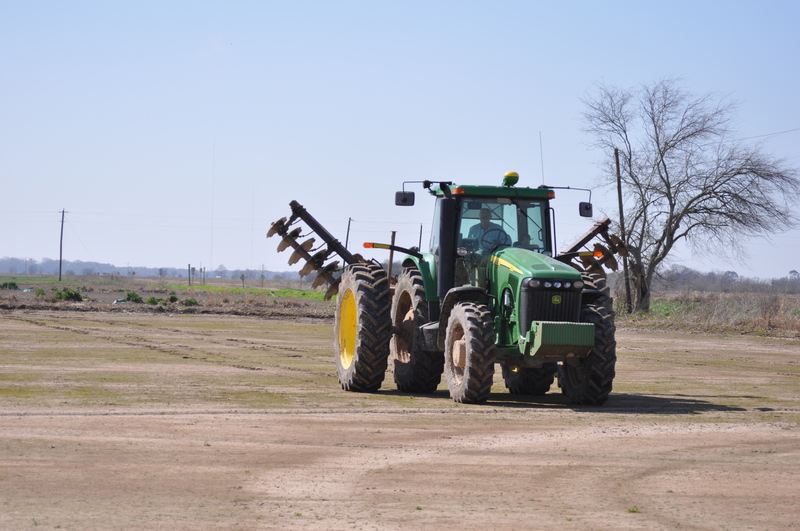 Rice will be drilled into the stale seedbed at around 25 pounds per acre. This soybean-rice rotation can sometimes be conducive to injury from the colaspis beetle. We’ll be sure to monitor for injury from this pest when we take stand counts two weeks after emergence. (All photos taken by Anna Meszaros). I received this message from Dr. Coreil, the Vice-Chancellor and Director of the Louisiana Cooperative Extension Service. 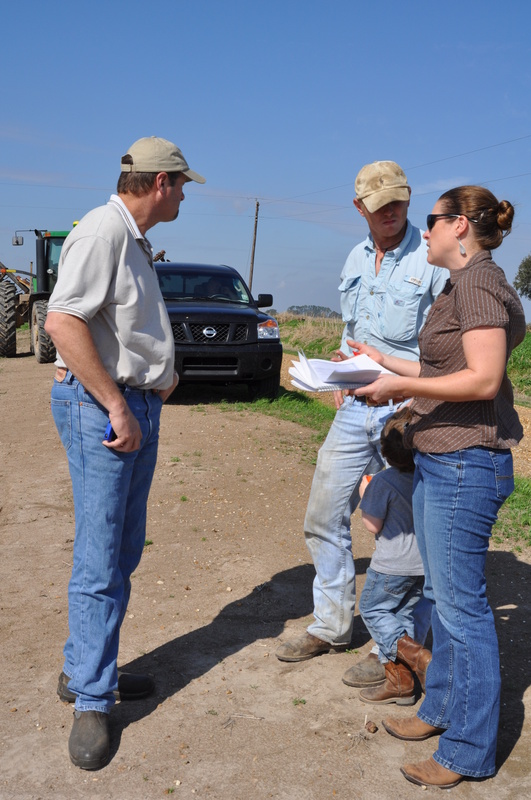 I would encourage you to read it through so that you will be aware of continuing challenges we face over funding for Cooperative Extension Service activities in Louisiana. The Smith-Lever program would be cut by $29.8 million, a reduction that would harm 4-H clubs across America (which provide positive youth development to more than 6 million youth) and other Cooperative Extension programs that help farmers and ranchers grow more food and consumers eat nutritiously. The Agriculture and Food Research Initiative would be cut by $34.7 million, a reduction that would dramatically scale back competitive grants that support critical national research of direct benefit to food, agriculture, and natural resources producers and consumers. (1) providing positive youth development for over 6 million youth across the nation, and (2) supplying the future workforce for the agriculture industry. Farmers and ranchers would have reduced access to reliable, current, research-based information to grow more and better food, provide jobs and stimulate/grow rural and urban economies. Food and nutrition programs that support the use of US farm commodities in feeding families according to healthy living guidelines would be reduced. The NIFA reductions – especially Smith-Lever reductions – are very damaging to what we do in all 64 Louisiana parishes. Concerned stakeholders can help reduce these damaging cuts before the CR becomes law. Smith-Lever should be funded at no less than the FY 2010 enacted levels. Anyone that would like to contact their congressional representative and/or senators can go to: http://house.gov and enter your Zip code at the top left. (Under the logo). On Feb 7, 2011, US EPA granted the Experimental Use Permit (EUP) for NipsIt INSIDE® Insecticide for seed treatment use in rice. The EUP is for the states of AR, LA, MS and TX for a total of 40,000 acres for 2011 (and 40,000 acres for 2012 used prior to 6/23/2012). This includes 5,000 acres in Louisiana. Rice water weevil and grape colaspis are target pests on the label. According to the EUP, use of this product is restricted to dry-seeded rice in drill-planters. The seeding rate cannot exceed 150 lbs/acre. The active ingredient in NipsitINSIDE is clothianidin which belongs to the neonicotinoid class of chemistry (the same class as CruiserMaxx). 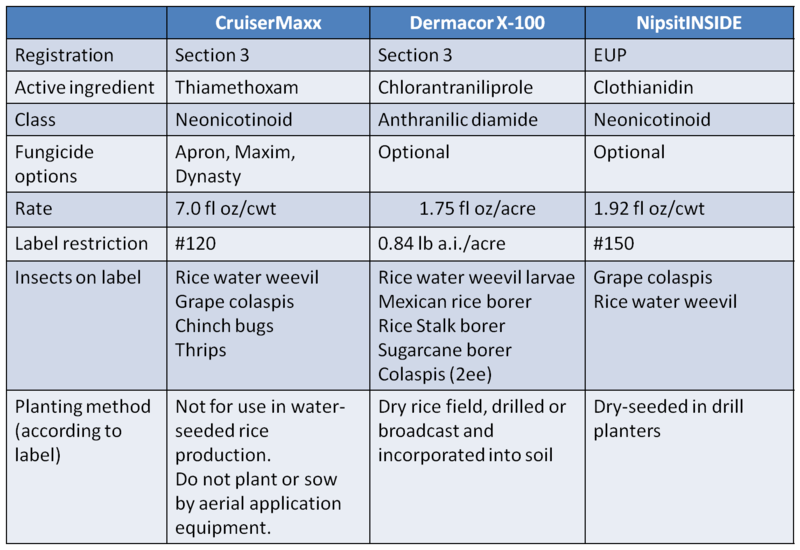 We will include NipsitINSIDE in our 2011 rww demonstration test, with comparisons to CruiserMaxx rice and Dermacor X-100. For more information on NipsitINSIDE in Louisiana, you can contact your local County Agent or Mr. John Bordlee. Update: Lunch will be sponsored by Toby McCown (DuPont Crop Protection), Henry Stefanski (FMC), and Josh Zaunbrecher (Syngenta). Door prizes will be provided by John Bordlee (Valent). We appreciate their support of the training. Location: LSU AgCenter Rice Research Station Auditorium – Crowley, LA. Click here for directions. You can download Mike’s powerpoint file by clicking here. You can download Rick’s powerpoint file by clicking here. You can visit the online id guide by clicking here. A video recording of the presentations can be found by clicking here. Continuing education units will be available. The presentations will be recorded and posted online. The program and meeting details can be found at this link. Before the start of the meeting (from 11 am to 1 pm on Wednesday) we will show a series of scouting videos that LSU AgCenter specialists have posted at www.lsuagcenter.com. These videos include insects, diseases and weeds that affect rice, soybeans, and cotton. During the opening session on Wednesday afternoon, I’ll speak about using social media in agriculture. The rice sessions will be held Thursday afternoon and Friday morning. Mike Stout and I will both speak about insect pest management on Friday morning. Hope to see you at the meeting.